Is there a proper tee height to use for your driver? Tee height is one of the most debated topics related to driving the golf ball. We've all heard the saying, "tee it high and let it fly" but that is not always the best option. The idea is to use 3 unique tee heights - Our stock shot tee height for normal driving holes and conditions - A low tee height for producing penetrating shot into the wind and with roll and a final high tee height which is perfect for downwind drives or when carry is needed. Once you understand the different tee heights that make sense, you need to realizee that each tee height requires slight adjustments in setup. For example, if we tee the ball high at address, you will need to create extra axis tilt which will create lower spin and more of an acending blow. To accomplish this golf setup position, widen your stance and promote secondary axis tilt at address. In a stock golf shot with the driver, we want our normal, stacked golf position that we create by using the RotarySwing fundamentals that you learn while using our videos. Play the golf ball off the left ear. When you tee the ball low, you need to take out some of the secondary axis tilt in your swing so concentrate on keeping your left or lead shoulder lower or more level. This will create a decending strike and slight your golf ball with a lower trajectory. Today, we're going to be talking about how tee height and the position of your spine can help you optimize your distance, and also get you more control in the golf course. Okay guys, so before we start getting into the golf swing mechanics and how it's going to be important to control the position of your spine, and the hitting area; I want to go ahead and discuss the three different tee heights that I like to use when on the golf course here. In this first tee height, you're going to notice that the ball is pretty much completely above the face. Now, this is the ball that I call 'tee it high and let it fly.' These are going to be ones that we're really trying to get the ball to be in a very high condition with very low spin. I like to play this shot on days that there's not tons of winds, or if it's a hole that's playing dead down wind. We want to really tee it high, let it fly, take advantage of the wind. Also, another good time to use it is if you have some cross wind on the golf course. You can use the wind to your advantage to help get the ball back into play and further down the fairway. This is another one that you can use this particular tee height on. This low ball right here, this is what I call my 'low bow bullet ball.' Now, this is a ball that's great for really windy conditions. If you're playing a hole that's dead back into the wind, this is going to help you flight your golf ball down quite a bit. This is also good for those players that are starting to try to work the golf ball left to right off the tee. If you have a hole that's set up to where you're going to need to start curving the ball, or making it hitting a cut shot, this is a great way to start to do that. You'll notice that this ball position on the club face is pretty low. It's pretty much what I have, just right in the center of the face is really where I tee it up. Again, we have the 'tee it high, let it fly.' We've got the 'stock shot.' Then, we got the 'low bow bullet' here. Let's go ahead and talk about the position of the spine now, how it's going to affect each one of these shots; so you can start optimizing the distance and start optimizing that control. Okay, so now that we've looked at the various tee heights here, let's talk about the various spine positions that you're going to be working with, with each one of these balls so that you have a good understanding of what you're going to be looking for to help get these things launched properly. With the ball that we had first here, the one we were going to call 'tee it high, let it fly,' we're going to be trying to promote a lot of secondary axis tilt. Now, what is it axis tilt? A lot of you may be asking right now. Well, axis tilt is just simply the position or the angle to my spine here from a face-on perspective. At address, we like to have our spine just inside of our lead knee. For a 'stock shot,' you'll notice that our spine just shifts just outside of our lead knee. 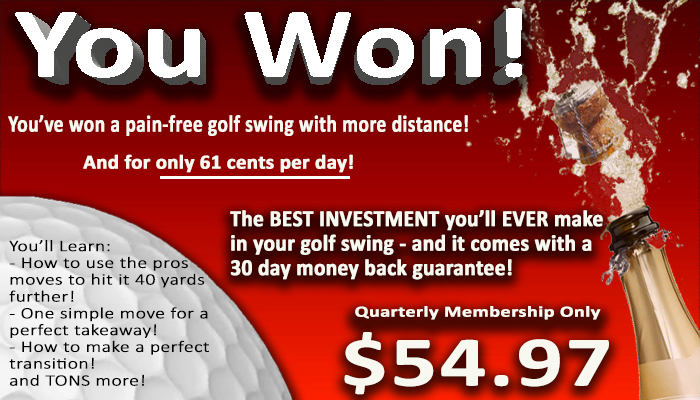 Now, what does axis tilt do to your golf swing? Well, what it does is it helps shallow your golf swing out quite a bit. What I mean there is if you turn down the line here, and I were to lean my spine away from the target, you're going to notice that the shaft plane lays flat here. Now, why is that important to your golf swing? Well, it's going to help get your golf ball, specially with a 'tee it high, let it fly' condition, it's going to help you get the golf club on a more an ascending blow, rather than a descending blow. A lot of these drivers these days are set up for very high launch conditions with very little ball spin. What we're going to be trying to do with the 'tee it high, let it fly ball' is we're going to be trying to promote more secondary axis tilt by widening our base a little bit and then moving our ball position a little bit more forward. When we start to shift our pelvis forward, over to our lead side with a wider base, and we keep our head quiet, you're going to notice that your spine wants to lean back a little bit more here. Again, that's going to help create more of an ascending blow, rather than a descending blow. Now, with what we're going to do in our 'stock shot' format is we're not going to go to a wider base here. What we're going to do is we're going to just try to keep all of those things that we've worked through with RST is simple as possible here, we're going to go to our normal stance with. We're going to have the ball position off of our left ear. We're not going to try to promote anymore secondary axis tilt. We would just promote it just outside the lead knee here. Now, will a 'low ball' here, what we're going to be trying to do is we're going to try to keep our lead shoulder very low in transition. We're almost going to be trying to take out some of that secondary axis tilt. Now, so just as the opposite here, if I were lean my spine away, if my spine were to feel like it was moving towards the target here, that would help give the golf club coming down a little bit steeper, and make this shot a little bit easier for me to hit because we're going to be trying to hit down on it quite a bit here. Again, the 'tee it high, let it fly' ball, we're going to widen our base up a little bit here. Okay, we're going to promote a little bit more secondary axis tilt by keeping our head back. Number two ball, the stock ball, we're just going to keep all of the RST fundamentals the same here. Proper stance with golf ball position off the left ear. We're going to just try to keep our spine just outside of our lead knee down in the hitting area. Then, this low bow bullet ball, we're going to try to keep our left shoulder much lower down to the hitting area to keep our spine a little bit more vertical. That way, we can hit down on the golf ball and be able to flight it lower, be able to control that spin, and also be able to keep the ball down through the wind so it's boring through the wind. Let's go ahead and take a look at what these look like and hopefully you guys can get some good usage out of this. Okay, so let's go ahead and take a look at the high launch ball here. You're going to notice that that ball is almost completely above the face. I've gone ahead and widened my base here quite a bit. Ball position's going to be quite a bit more forward with where we would normally play it. Okay, what I'm going to try to do is make sure when I come down on the hitting area, I'm going to keep my head really quiet when I'm shifting my weight so I'm going to promote a little bit more secondary tilt. I'm going to try really get that thing launching. There we go. It did pretty good there. All right, so let's go ahead and take a look at the stock ball now. This is where we're going to go back to our normal stance with. We're going to go back to our normal ball position here, right off my left ear. Okay, all we're going to try to do is try to promote just enough tilt just to have it outside the knee. All of our other RST fundamentals stay the same. There you go. Now, the 'low bow bullet ball.' This is the one where we're going to try to make sure our left shoulder is going to stay much lower in transition, take out some of that tilt so we can really flight that golf ball down. Get in underneath the wind. There you go. All right, guys, so now that you've seen my different tee heights here, and we've talked a little bit about how axis tilt's going to ultimately affect the way the golf club enters the hitting area and can help you start creating more of an ascending blow rather than a descending blow. If you've been struggling with either creating too much secondary axis tilt and haven't really had a solution on how to fix that, we've got an absolutely fantastic video that a lot of golfers get success with, and that's called the level shoulders drill. That's in the downswing section; so level shoulders video. It's going to teach you what you want your shoulders to be able to look like down into the hitting area; so that you don't start to get the club shallowing out too much. Then, you can start to compress the golf ball properly. Also, check out the video called 'The Driver Set Up Adjustments' video. That's another great video that talks to you about the sciences of why we make these little minor set up adjustments to help get that golf ball launching in the air. Then also, 'The Importance of Launch. 'The Importance of Launch' is another video that's going to talk to you about the sciences and why we want to get that golf ball really launching in the air in certain circumstances on the golf course. Now, let's get out there, guys. Let's play some great golf. Get Your Free Membership to Finish Watching "Proper Tee Height | Optimize Distance and Control " Right Now!